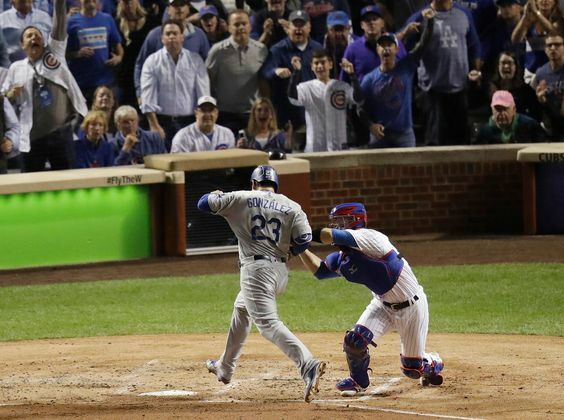 NLCS Game 1: Miguel Montero’s grand slam thwarts Dodgers’ comeback. CHICAGO — Joe Blanton hung an 0-2 slider to Miguel Montero with the bases loaded in the eighth inning and Montero made the Dodgers pay. His grand slam broke open a 3-3 tie and the Dodgers ultimately lost Game 1 of the National League Championship Series, 8-4. The box score is here. The photo gallery is here. The Cubs’ vaunted defense set the tone early in a close game. What’s the point of pain if the rest of us can’t find delight in the suffering of others, asks columnist Jeff Miller. Clayton Kershaw will take the ball Sunday for the third time in six days, which he’s never done before. 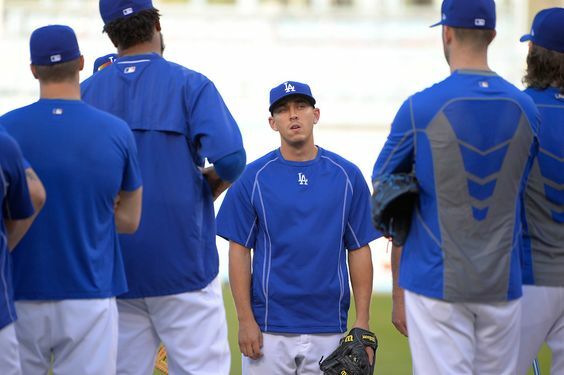 Some notes on that, Tommy Lasorda’s health, and the new-look NLCS roster can be found here. 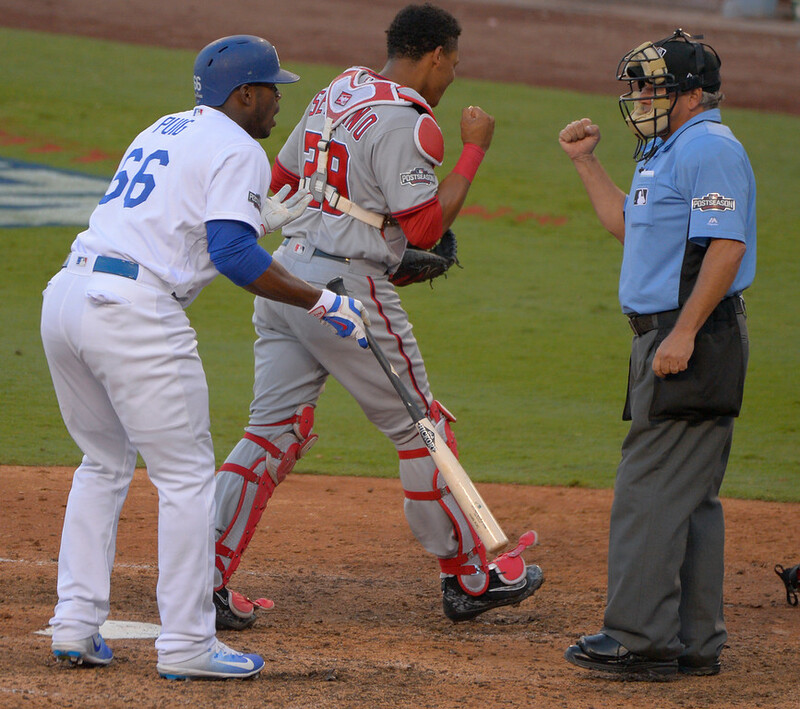 NLDS Game 4: Dodgers rally past Washington Nationals to force a Game 5. An eighth-inning rally washed over a hauntingly familiar seventh-inning collapse in the Dodgers’ 6-5 win over the Washington Nationals. The box score is here. The photo gallery is here. Joe Blanton‘s long journey put him in the spotlight again, writes columnist Mark Whicker. Game 5 is at 5 p.m. Thursday in Washington D.C. The winner plays the Chicago Cubs in the National League Championship Series. 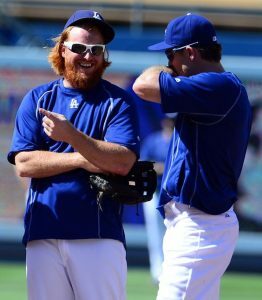 Justin Turner guaranteed a victory, writes columnist Jeff Miller. A 2 p.m. start time, revealed on short notice, meant a smaller crowd and cheaper tickets. 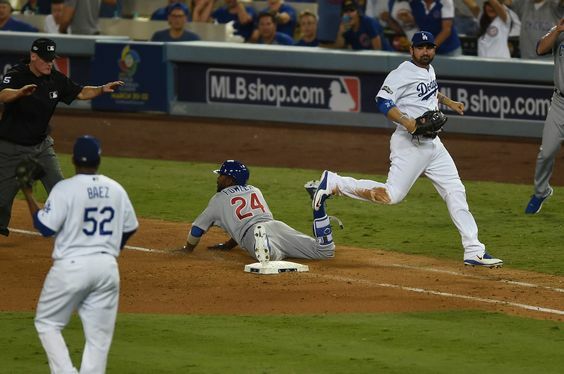 Andre Ethier came through with a big pinch hit.